Si-TECH, INC. stocks an inventory of silicon wafers in a wide variety of specifications to meet your requirements for test, monitor, and prime material. We have a large selection of diameters, type/dopants, orientations, resistivities, thicknesses and grades in stock for immediate delivery. Additionally, Si-TECH, INC. provides technical consulting services to the semiconductor industry. Our staff has over 50 cumulative years of experience in all facets of the industry. Visit our inventory page to see a partial listing of items we have in stock. Resistivities: From less than 0.004 ohm-cm to greater than 5000 ohm-cm for P-type and N-type CZ, MCZ, and FZ substrates. 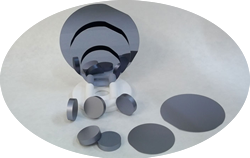 Si-TECH, INC. offers type III - V compound wafers and ingots as well. These materials include Gallium Arsinide, Germanium, and Indium Phoshide. All this material will be grown to customer specifications and subject to minimum order sizes. Si-TECH also supplies Silicon Carbide.50.8mm and 100mm diameter wafers are available. Please look below for the specifications we typically have to offer. Si-TECH now offers wafer cassettes. We have single wafer carriers ranging from 100mm up to and including 300mm available. Also, we carry 25 piece carriers from 50.8mm up to and including 300mm Si-TECH can provide you with the carrier you require to transport your wafers. Si-TECH can also reclaim certain cassettes. METAL GRANULES, PELLETS AND SLUGS. In addition to wafers, Si-TECH can provide you with various metals in slug, pellet and granule form. These metals include but are not limited to Aluminum, Titanium, Zinc, Copper, Indium. Please contact us with your requirements. Si-TECH can provide Spin-On Materials. The Spin-On Materials that Si-TECH can apply to a substrate are Lithium, Boron, Sodium, Aluminum, Phosphorous, Titanium, Copper, Zinc, Gallium, Yttrium, Palladium, Indium, Tin, Antimony, Barium, Neodymium, Tantalum, Gold and Platinum. Please contact us for more information. Si-TECH offers sputtering targets such as Chromium, Germanium, Gold, Iron, Nickel, Palladium, Platinum, Rhenium, Silicon, Silver, Aluminum-Copper, Copper-Zinc, Nickel-Aluminum, Nickel-Chromium, Silicon-Aluminum, Silicon Dioxide, Titanium-Aluminum, Titanium Dioxide, and Zinc-Oxide. Please call, fax or e-mail for price and delivery information.